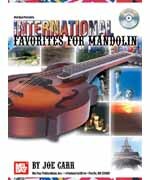 This new book and CD combination features 28 beloved melodies from around the world, especially arranged for the mandolin. Easy to play and beautiful to hear, many of the tunes are arranged for solo mandolin in a chord melody style. Over 20 different countries are represented here with dance tunes, lullabies, national favorites and even three national anthems! Popular favorites such as �Hava Nagila', �Greensleeves' and �Waltzing Matilda' are mixed with lesser known, but equally beautiful gems. For mandolin players of all levels.